My friend, Kevin, read yesterday's blog post about temptation. "So, what are you going to do for 'u', 'ubiquitous'?" he asked. As I had the "u" post all planned, I laughed, but it did get me thinking. Words. Love 'em. They are 'ubiquitous' and human language depends upon word comprehension. It's been argued that our pets understand simply language simply because of repetition; "No! ", "Sit! ", their name, as examples. You wouldn't be reading this blog if my communication was in hieroglyphics. Someone might take the time to decipher the code but the bulk of people would not. Words. I believe I have mentioned how I had to write a thesis for my degree in English. It had to be a minimum of 15 pages and cite at least 7 sources. At the time we took the class which helped you create your topic, write your paper and then learn to defend it, in my Victorian English literature class, we were reading Lewis Carroll, Alice: Through the Lookingglass and What She Found There. Lewis Carroll was a master of words. I like Through the Lookingglass better than Alice in Wonderland simply because of the use of language. I wrote my senior paper on "Nonsense Language in Through the Lookingglass". My argument was that seeming "nonsensical" language, was actually highly logical in structure and this sprang from Carroll having a background in math. As with a quote on language and invective earlier this month, a few lines from Through the Lookingglass have stayed with me. 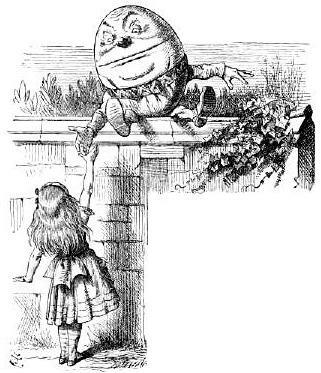 "When I use a word,"Humpty Dumpty said, in a rather scornful tone. "It means just what I choose it to mean - neither more or less." "The question is," said Alice, "whether you can make words mean no many different things." "The question is," said Humpty Dumpty, "which is to be master, that's all." Being able to master words is a good tool to have. We use words, carefully chosen, to comfort, incite, rally, inflame. In college, I knew a couple people whose grandparents had come from Germany right after World War II. They said their parents never listened to Hitler on the radio. They always read his speech the next day. Reading took the passion, the pregnant pauses, the vocal inflection right out and they could see exactly what he was using language to do. In this age of instant text, part of me yearns for the days when you actually paused before sending things into the ether. Words, so capable of solace, are also so capable of wounding. As I come to the end of this theme, which has been lots of fun, I'm looking ahead to doing another theme, maybe not right away, maybe at the beginning of February. One thing that has challenged me is using the word of the day in a sentence. I used to save these and, when I wrote letters to friends, would challenge myself to use them, correctly, in sentences. I discovered my favorite word, obnubilate, this way. Here are the weekend words. 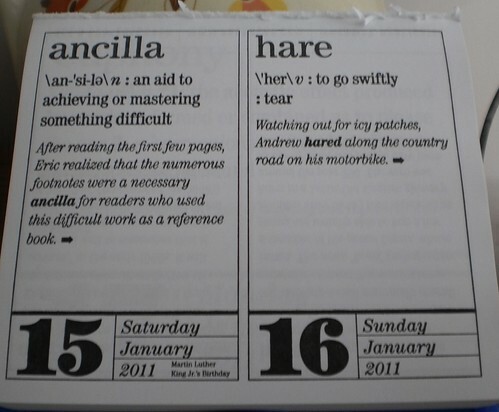 I could challenge myself to, for a month, use the word of the day in a blog post. Jessie has asked me to consider a photo a day. Both are interesting, both worthy of exploration. After all, isn't a picture equated with some kind of amount of verbiage?